Background: Breakthroughs in research increasingly depend on complex software libraries, tools, and applications aimed at supporting specific science, engineering, business, or humanities disciplines. The complexity and criticality of this software motivate the need for ensuring quality and reliability. Software metrics are a key tool for assessing, measuring, and understanding software quality and reliability. 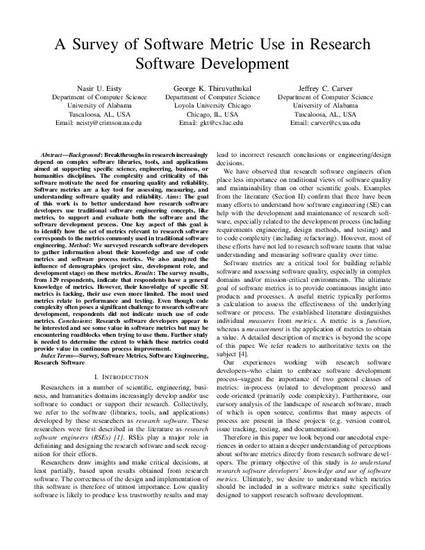 Aims: The goal of this work is to better understand how research software developers use traditional software engineering concepts, like metrics, to support and evaluate both the software and the software development process. One key aspect of this goal is to identify how the set of metrics relevant to research software corresponds to the metrics commonly used in traditional software engineering. Method: We surveyed research software developers to gather information about their knowledge and use of code metrics and software process metrics. We also analyzed the influence of demographics (project size, development role, and development stage) on these metrics. Results: The survey results, from 129 respondents, indicate that respondents have a general knowledge of metrics. However, their knowledge of specific SE metrics is lacking, their use even more limited. The most used metrics relate to performance and testing. Even though code complexity often poses a significant challenge to research software development, respondents did not indicate much use of code metrics. Conclusions: Research software developers appear to be interested and see some value in software metrics but may be encountering roadblocks when trying to use them. Further study is needed to determine the extent to which these metrics could provide value in continuous process improvement.